Shuji Yamamoto But I don't understand we have Saubi Island in IOTA Directory. 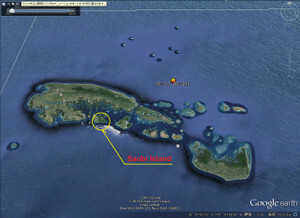 Saubi Island and Saobi Island is the same Island or not? Nusantara Award Saobi and Saubi is the same island. 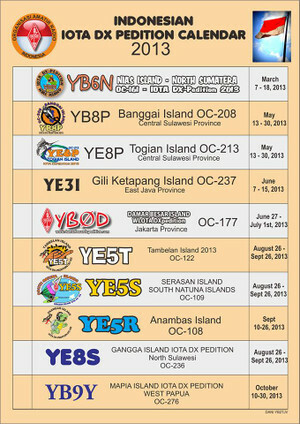 Saobi Island OC-217 will be activated on Aug 29-31, 2013 using callsign YB3MM/P. 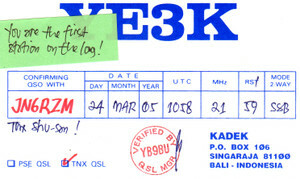 15m and 20m bands, SSB with some CW & PSK31. Shuji Yamamoto YE3K operation is Kangean Island, I think. Is this OC-217 Saobi Island anther Island? Unfortunately, tomorrow there will no ship to Bawean Is OC-197. 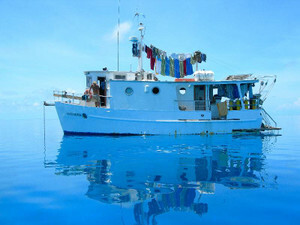 But, received a good news that tomorrow there will be a ship to Kangean Island. So immediately I would like to switch my plan to go to Kangean Is OC-217. Will prepare everything this evening. Wish me luck. 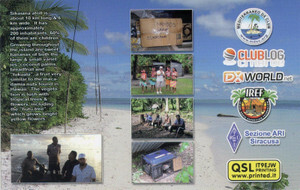 Yes,I'm not QRV from OC-150 because a little bit trouble with my health,but now is all OK.
HGangga Island will be QRV from 30 Aug to 1 Sept 2013. Tomorow will be move to Manado City. Hope to work you from Gangga Island OC-236. I am sorry to inform that YE5T and YE5S operation will be postponed. good until the end of September. September so they would have more operators from Anambas. 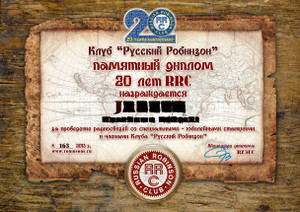 Sorry for the delay, but I'm not QSL-Manager, I only help to RI0K/p. GM John-san, All OK, undrestood. I think the first purpose and most important things are your safty trip. This photo is left of the island Utan before YC4FIJ / P. Very simple operation with the old equipment. Might later be back there with a more perfect preparation. It's OK. You are in Tanjung Pinang Bintan Island. I will be OK for my operation anytime. If I can catch him In this evening I will call you back, I stay here until 23/8 AND going to Jakarta at 07.00 local time early morning. 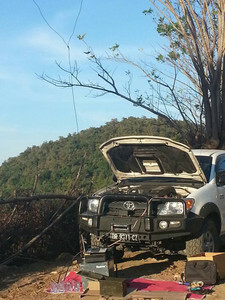 OC-075 Bintan Island YB5NOF/P after OC-108 1 or 2 days op. I'll always planned go to Utan Island again...maybe next time, looking for my turtle hi hi...I like a little conservation..but now is bad weather..at least few month no one go there...strong wind and high sea wave.. 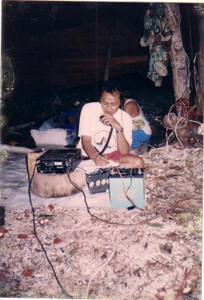 I'm still searching for photo my activities several times to Utan Island..next time I'll send to you. 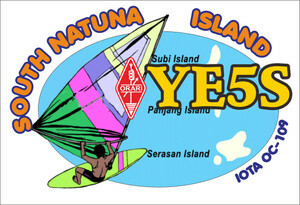 I'm also dreaming to QRV in another island around Belitung..
Oke.if any friends from JA wanted OC144...just email, we plan sked. which is not good for antennas,hi! I look forward to working you some day. On monday I go to Batam meeting with Orari there...OC106 will on from TAREMPA located on Anambas Island starting on The midle of September. We will go there after YE5S activity. From Batam I go to Tanjung Pinang Bintan Isl, cheking The ship schedule to go to Tambrlan and Serasan if has a fixed date I will send Msg to you. 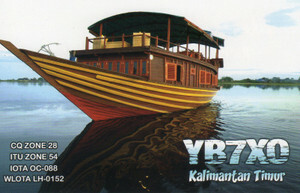 Did you need Bintan Isl OC75? I try I do it I thing for 1 day IS enougjh. Ahahaha. Yes, I need Bintan Island now for my Nusantara Award. Now I checked "Tarempa Indonesia". It's on Siantan Island. 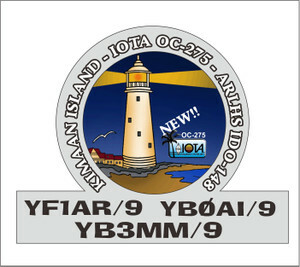 But Siantan Island is IOTA OC-108. Is it true??? Ok, I will check again tomorrow morning. Thanks. John-san. Thank you John-san. Roger roger. I hope you are good health. Good night. Crank up your speakers and ROCK ON !!! Can you help mein getting contact? Here under you will find the mail I want to send him. 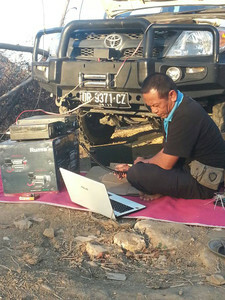 Kardi YB9KA is mobile operating from Bendungan Batubulan in the island of Sumbawa, which is OC 150 but counts separately for Nusantara (Indonesian Islands) Award Program. 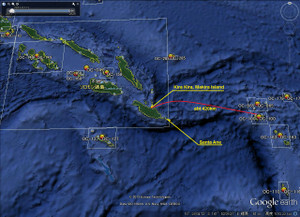 Tomorrow , he plans to operate from Bungin Island which he referred to "the densest little island". 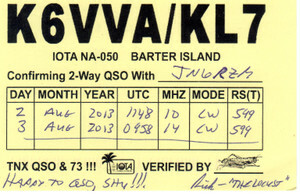 He had a decent signal yesterday around 14z to the east coast on 15M. 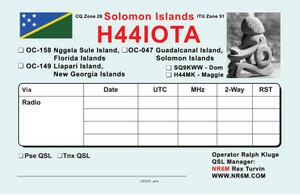 I have checked with our QSL manager and he said he has been sending out QSL cards since beginning of August as the printer has some delay for the QSL cards. Sorry for the delay. 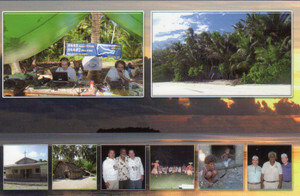 Maybe because there are so many requests for Direct QSL card. Please wait for another week. 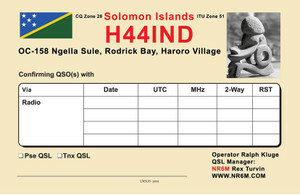 It should be arriving at your QTH very soon. It is a full week break here because of the Ramadhan New Year for the Muslims. 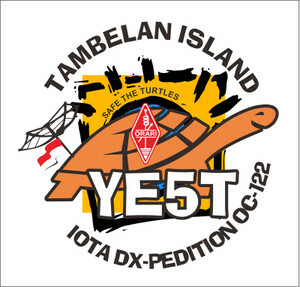 Yes, fhe YB0D expedition is ok for IOTA and also for WLOTA awards. 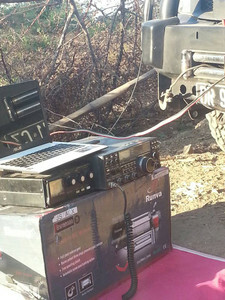 We have already get approval from both IOTA and WLOTA. Also good for the Nusantara Award as it is also sponsored by ORARI. 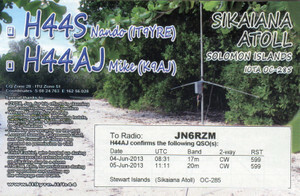 to activate are Coastal Islands North OC-258 because I have not been there. a few hours. But Aki, JA1NLX is going there next month! Is EU-106 St. Tudwal's Islands rare for Japan? I have been looking at that recently. So I want to encourage you again to find a way to put a Vertical with MANY Radials on TOP of your apartment building roof !!!!!!! You will be very happy !!!!!!! You can do it !!!!!!! We have also had very hot weather here in England. I like it! How long do you stay OC-100? Do you have 20 m? Can you set up VHF equipments on OC-100? I am listening on your sugnal everyday on 14178/14260/21260. But very sorry, it's weak. I can hear something on 14250. Wow JA8ECS calling you. I can not promise you this time. This is all the more radio devices is secured in place rather high. Ambon City 95% were flooded and landslides already 1 week. Ambon island heavy rain at any time up until now. many people died, people lost and loss of property. My house is very high but also flooded, YB8VM home om Martin also experienced landslides and severe. Maybe I'll finish Rainy Season Try sked with your companion and friend JA. Greetings to all friends. Yes, thanks, Joppy-san. I and JA friends are waiting for your good condition. Please be safty. 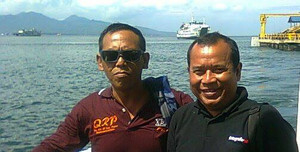 My 8 friends would like to contact with your OC-070 Ambon Island. Thanks Joppy-san. GM Shu san...all of OC in Riau Isl will complete after our d'expesition last August AND September, I hope The local stn on that Island will active on the air next. But for the other island for NII have many small island here. 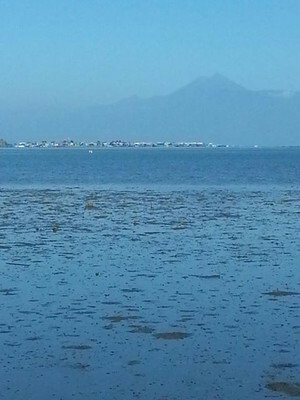 On the next, perhaps on 2014, when I have a chance, I will going to those Isl, starting from PULAU JEMUR at the end of September because this Isl vy important for Republik Indoneaia, it's located on the Borders with Malaysia. 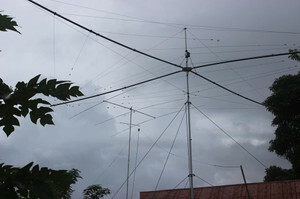 Right row I can only work on 20m. I hope I can have V-dipole antenna that can work on 20, 15, & 10 meter band, so we can sked on other band also. Our schedule on the air from OC122 at 28/8 for 5 days and from OC109 at 4/9 for 5 days too....how do you think. 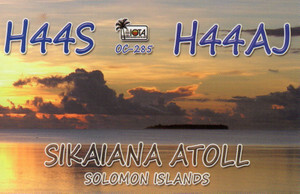 I have The map both of The Island Yesus Midai Ia OC 109..
H44AJ (OC-285) cards from printer IT9EJW arrived here yesterday. were mailed this afternoon at my local post office. Direct request cards will be processed next. Fuel and smokes on board, leaving Kira Kira now for Santa Ana,another motor episode. 2.a. 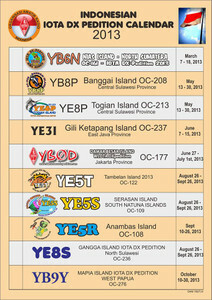 Basic award is issued for contacting 10 different islands which must include a minimum of 5 out of 6 main islands of Jawa / Java (YB0,1,2,3) , Sumatera / Sumatra (YB4,5,6) , Kalimantan / Borneo (YB7), Sulawesi / Celebes (YB8) , Irian / Papua (YB9), and Bali (YB9). GM Shu san...how are u...I have write all qsl card, TI day I send by AIR MAIL and have 5 stn send me 10 Green stamp so for them I send by REGISTER&EXPRESMAIL. Next week after IDUL FITRI I go to Tanjung Pinang for cheking all of our fasility to go to OC 122&109. 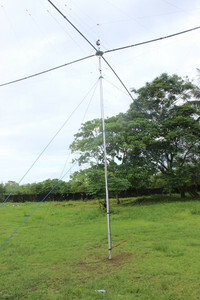 We try to get 2 trx it can borrow from our friend in Batam and Tanjung Pinang, so will running from 3 stn with yagi, vertikal high-gain and dipole. 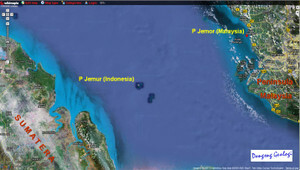 All without liniair... but I hope we can do like our Peleng Island. Sorry to be late. John-san, Thank you very much for your detailed information. It will be great job, I think so. How's your schedule? And please make the application for GDXF and IREF. I think Anton-san make those easy. And your signal was very clear and strong. 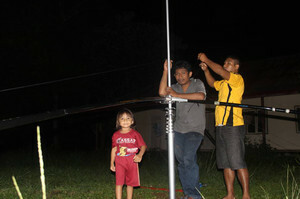 On 28th July night, I and 2 JA friends made a Sked with OC-166 YB3MM/7 by 3 elementa Yagi. But no signal on 21325. I didn't expect your signal, but strong. last signal is 57. Very clear. I and JG1UKW Toshi-san are very very very happppppy!!!! Anyway, Please check for preparing OC-122/OC-109. I think all ok. I just go to Batam and try to find 2 tranceiver there, I Hope can borrow by our friend whos want to go with us hi hi hi. Any how I bilieve every thing will be clear. I will tell Anton to make application, so I hope we can get the donation. Ok Shu san this afternoon we will meeting with ORARI RIAU for our next activity to Tambelan.